Lightning McQueen is used to racing around the track for the Piston Cup, but he'll take a break to make your child's birthday party the best possible. We have Cars cups, plates and so much more. Everything you need to create an amazing party is at your fingertips. All of our party favors and party supplies can be yours, so get them today. Start your engines with Disney Cars Party Supplies! 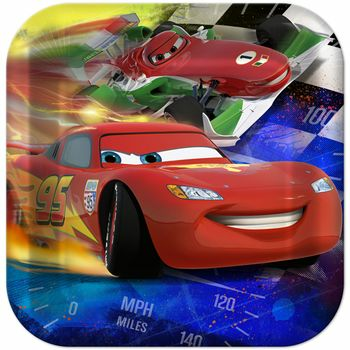 Cars Party Supplies feature Lightning McQueen and the Cars gang on tableware, plates, napkins, and party kits. Add party favors, decorations, and invitations to Cars Party Supplies for a Cars birthday that puts the rubber to the road! Mix Disney Cars Party Supplies with our solid color tableware for a custom birthday theme. Disney Cars Dream Party Birthday 9" Square Lunch Plates, 8ct. Disney Cars Dream Party Birthday 7" Square Dessert Plates, 8ct. Disney Cars Dream Party Birthday 9oz. Paper Cups, 8ct. Disney Cars Dream Party Birthday Lunch Napkins, 16ct. Disney Cars Dream Party Birthday Plastic Treat Bags, 8ct. Disney Cars Dream Party Birthday Medal Favors, 4ct. Disney Cars Dream Party Birthday Activity Book, 4ct. Disney Cars Dream Party Birthday Invitations, 8ct.